"Maximize your productivity, send a voice e-mail"
Speak-A-Message Home Edition is a software designed to replace written messages with your own voice. 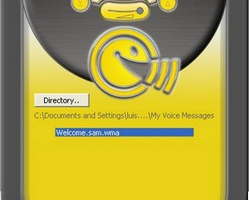 It provides a simple recording interface and can automatically attach the WMA (Windows audio) file to an outgoing message, using your default e-mail client. The recipient can then listen to the audio or read the transcript, even without having Speak-A-Message installed. This great utility also allows you to record comments to your photos, upload to your Facebook wall and create personalized audio greeting cards. The speech recognition feature transcribes your voice message to text. Another important feature is the good compression: about 500kb for a 4 minute voice message, playable with all common media players. You can even mark the message send with Speak-A-Message as private, so the recipient knows playback should occur in private or with headphones.